It arguably has been one of the most difficult meets of veteran trainer Kenny McPeek's 34-year career with the passing of exercise rider Odanis Acuna last Saturday. But the lifelong horseman hopes to move forward into next weekend's Stars of Tomorrow II program at Churchill Downs with talented juveniles Signalman and Restless Rider in the $200,000 Kentucky Jockey Club (Grade II) and $200,000 Golden Rod (GII), respectively. Looking ahead to Saturday's Stars of Tomorrow II program at Churchill Downs, McPeek hopes Breeders' Cup Juvenile third Signalman and Breeders' Cup Juvenile Fillies (GI) runner-up Restless Rider can help the stable slowly move forward. “We're really excited about both of these horses in their own rights,” McPeek said. “Signalman, which was a very inexpensive purchase ($32,000 at the 2017 Fasig Tipton October Sale), is a really big, strong colt. When he drew the outside post in the Juvenile, I told Brian (Hernandez Jr.) to just take back to find a spot at the rail. I thought he ran a very credible race with the way the track was playing and can only improve from that in the Jockey Club. 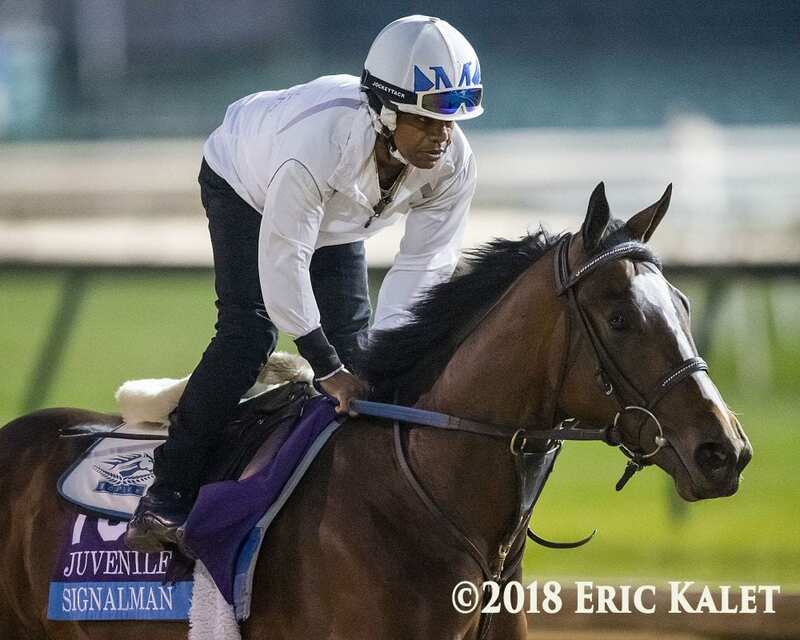 Signalman, who stands more than 17 hands tall according to McPeek, finished second behind Knicks Go in the Oct. 6 Breeders' Futurity (GI) at Keeneland prior to his third-place effort at 60-1 in the Breeders' Cup Juvenile. Restless Rider trounced the competition by 11 ¼ lengths in the Debutante Stakes in late June at Churchill Downs after getting stopped entering the far turn. The Distorted Humor filly then finished second in the Spinaway (GI) at Saratoga before winning the Alcibiades (GI) by 2 ½ lengths at Keeneland. The 12-race Stars of Tomorrow II program has launched the careers of many Grade I winners and champions including 2017 Horse of the Year Gun Runner, 2010 Kentucky Derby winner Super Saver and 2012 Clark Handicap hero Shackleford. Entries for Saturday's program will be taken on Wednesday. This entry was posted in People and tagged churchill, churchill downs, Golden Rod, ken mcpeek, Kentucky Jockey Club, odanis acuna, restless rider, signalman, Stars of Tomorrow by Press Release. Bookmark the permalink.